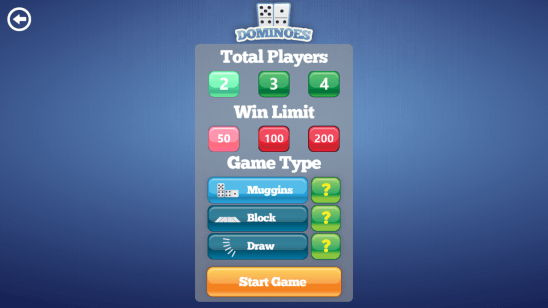 Dominoes is a free Dominoes game app for Windows 8. 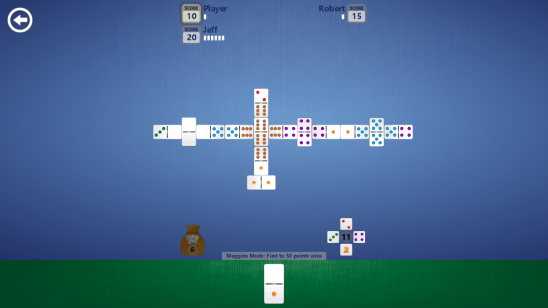 With this app you can enjoy playing Dominoes on your Windows 8 PC. For those who don’t know about Dominoes, well Dominoes is a tile based strategy game for two to four players, which is played with a set of specially marked tiles called Dominoes/Bones. It is basically a collection of games, each having similar rules but with little difference. A standard set contains 28 rectangular tiles marked between 0 to 6 on the face side. The back side is kept blank. Most of the Dominoes games have one common goal: to play all the dominoes that you’ll get or pick at the very beginning of the game after shuffling all the dominoes. You can do that by adding one of the initial dominoes that you have at either narrow end of the laid domino on the table. This version of Dominoes app for Windows 8 supports three types of games. If you don’t know how to play Dominoes, then you shouldn’t worry because the app will itself teach you how to play it. This Dominoes app is present under the Games Category in Windows Store. This dominoes app is a great medium to kill some time. Plus it gives a good exercise to your mind, as it requires you to use your brain because you need to think ahead before you make any move, so that you can block your opponent and finish playing all your tiles first. All different games of Dominoes follow same basic rule, and that is to finish playing all the bones (rectangular shaped dominoes tiles). As said before, the game is played between two to four players; each player gets 7 (and sometimes 5) Dominoes at the beginning. One of the player plays his first Domino, and the rest of the players play on their turn by adding a new domino having same number on the face side. A domino can be added only at the two or four open narrow ends of the laid dominoes. It is the scoring, which is different for each type of game. The game might sound difficult. But once you get your hands on the game, it will get easier. Playing dominoes on this Dominoes app is fun. You can choose between 2-4 players and then set a winning limit to 50, 100,or 200. There are three types of games, and they are: Block, Draw, and Muggins. Block and draw are similar, the only difference between them is: in Block you can’t draw any new bone from the bone yard (collection of dominoes) once you get blocked by other player, but in Draw you can pull out new domino to find a domino with matching number. But remember drawing dominoes add that many dominoes to initial seven dominoes that you got. Muggins is some what similar to Draw. But in Muggins you can add other dominoes from all four sides rather than the usual two sides. The game-play is good, animations are smooth, and graphics are fine. You’ll enjoy playing Dominoes within the app as much as you enjoy playing it in real world. 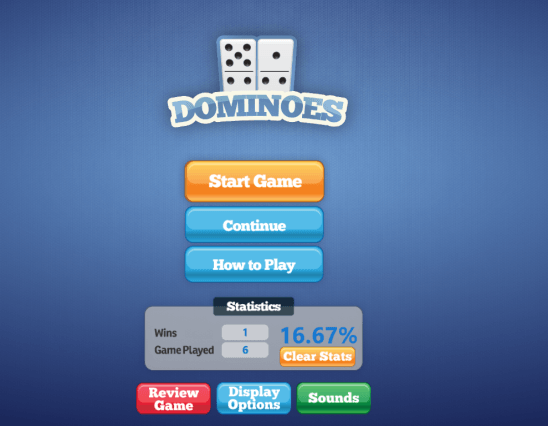 Good Dominoes game app for Windows 8. Good and easy to use UI. Supports 3 types of Dominoes games. Option to set score limit to 50, 100, or 200. Option to resume the last played game from where you left it. Inbuilt support for how to play. 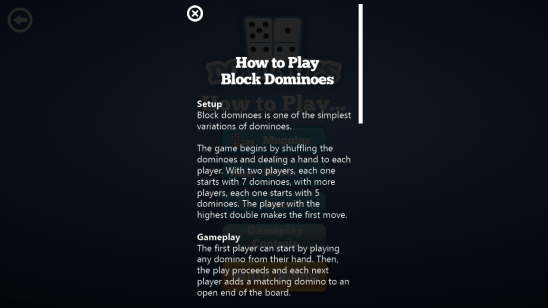 Dominoes for Windows 8 is well-made game app. It’s totally functional and fun to play. You don’t have to buy any Dominoes, and there’s no need to find any open space to play this game. The features of this app pull a lot of attention. It’s good that there are app versions of traditional games. This game definitely improves your strategy building ability and memory. All in all it’s great free game app for Windows 8.